The Cereal System Initiative South Asia (CSISA) is promoting zero-tillage technology for direct seeded rice (DSR) at a few places in and outside Pakistan. Zero-tillage for DSR, which reduces cost of production while increasing crop yields and farmers’ profits, has been successfully demonstrated through various CSISA traveling seminars and outreach programs. The practice, where the field is unplowed, is a different approach to conventional rice planting and many farmers are hesitant to try it. The CSISA team, however, convinced Mr. Muhammad Asif, a farmer in Sheikhupura District to try it on a half acre plot. Despite some problems and damages from grazing livestock, Mr. Asif saved more than PKR5,000 in planting cost. He plans to use the technology on 50 acres of his land next year. His neighbors are also considering using zero-tillage for DSR next year. 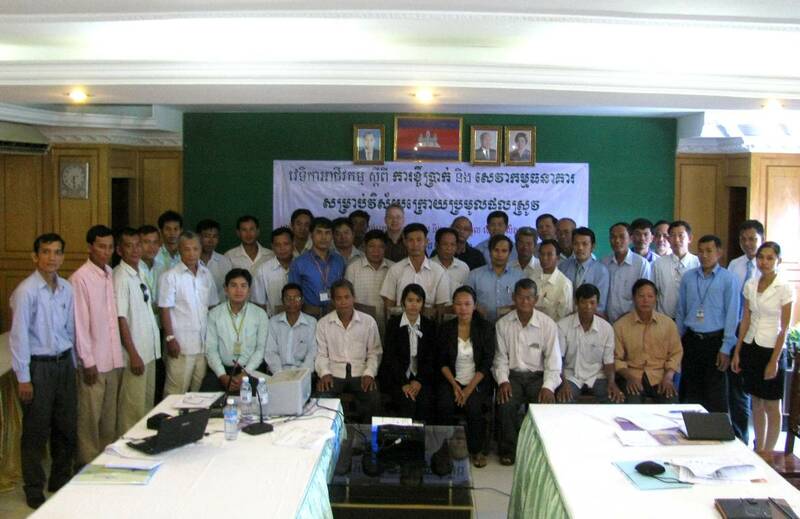 The Climate Change Affecting Land Use in the Mekong Delta: Adaptation of Rice-based Cropping Systems (CLUES) held its second semi-annual review and planning workshop on 8-10 August at Can Tho University (CTU) in Vietnam. More than 60 Vietnamese scientists and local staff from CTU, Cuu Long Delta Rice Research Institute (CLRRI), Southern Institute for Water Resources Planning (SIWRP), Institute of Agricultural Sciences for Southern Vietnam (IAS), and Department of Agriculture and Rural Development (DARD) of An Giang, Can Tho, Hau Giang and Bac Lieu provinces as well as scientists from the International Rice Research Institute (IRRI) and International Water Management Institute (IWMI) participated in the said activity. Established risk maps of saline intrusion and flooded area in the Mekong Delta and Bac Lieu province. Developed land use and soil map for Bac Lieu province as a coastal area in Mekong Delta. Assessed and analyzed climate change constraints in rice-based farming systems and the adaptive capacities of farmers in all study sites. Conducted a demonstration of alternate-wetting-and drying technology in Bac Lieu province with GIZ Bac Lieu for about 100 farmers. Selected 27 salt-tolerant lines including OM 5629 and OM 6677 and identified 12 genotypes with rapid recovery from stress such as MNR 1, MRN 4, MNR 3, OM 6677, and OM 70. The newly released acid-sulphate soil tolerant and salt-tolerant varieties are expected to be widely out-scaled through participatory varietal selection (PVS) trials and seed network activities. Evaluated 14 high-yielding genotypes with submergence tolerance in selected farmers' fields at Bac Lieu, An Giang, Hau Giang provinces and Can Tho city. Managed trials of 12 salt-sub tolerant high-yielding genotypes in selected farmers' fields at Bac Lieu province. Evaluated 12 rice genotypes with a degree of tolerance to stagnant flood in selected farmer’s fields at Hau Giang province. Screened a total of 300 local varieties (comprising 40 traditional varieties, 200 improved varieties and 60 IRRI varieties) of Vietnamese germplasm for good survival and recovery under anaerobic conditions. Established the different CH4 (methane gas) emission rates as influenced by different production factors. Emission rate of CH4 in conventional field plots were consistently greater than in alternate-wetting and drying (AWD) plots. In addition, the CH4 emission rates increased with plant age and reached the highest rate at flowering time and decreases with reduced water depth at harvesting time. CH4 emission rates with N fertilizer use were also found to be greater when compared with straw compost application at 6 t/ha. 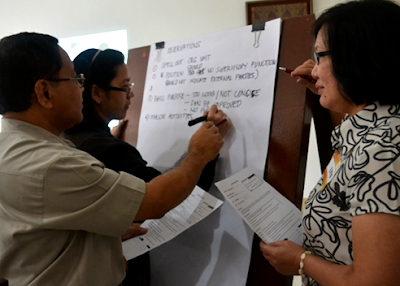 IRRI scientists Reiner Wassmann, To Phuc Tuong, Russell Reinke, Abdelbagi Ismail, Thelma Paris, Romeo Labios, and Ngo Dang Phong participated in the activity. IWMI was represented by Chu Thai Hoanh, while CTU was headed by Le Quang Tri. ACIAR Vietnam was represented by Geoff Morris and Vu Thi Hai. 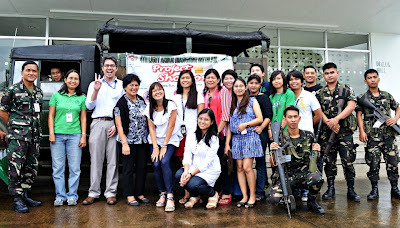 IRRI scientists and staff with DA-BAR Director Nicomedes Eleazar (center). 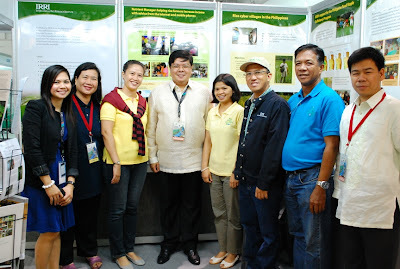 The International Rice Research Institute joined several government agencies and businesses in the 8th Agriculture and Fisheries Technology Forum and Product Exhibition on 9-12 August 2012 at Mega Trade Hall in SM Megamall. IRRI's participation was a response to an invitation from Nicomedes Eleazar, director of the Bureau of Agricultural Research of the Philippine Department of Agriculture (DA-BAR), through V. Bruce J. Tolentino, deputy director general for communications and partnerships. The event was attached to DA-BAR's 25th anniversary celebrations and has the theme BAR@25: Celebrating R and D Excellence in Agriculture and Fisheries. On exhibit were technologies and products from the Philippine regions including high-value crops, natural products and ingredients for health and wellness, and other ideas and techniques pertaining to organic agriculture, climate change, biofuels, livestock, and fisheries. Private entrepreneurs promoting their inventions and wellness products also took part. The IRRI booth featured posters that showcased IRRI's partnership with the DA on the following areas: IRRI support for the Philippine Food Staple Sufficiency Program, Nutrient Manager, community seed-banking in the Arakan Valley, and rice cyber-villages in the Philippines. The Nutrient Manager for Rice team (Rowena Castillo, Efren Laureles, and Apple Suplido) interacted with visitors to the IRRI booth and answered questions on NMRice, especially of farmers from as far as the Visayas and Mindanao. IRRI scientists Glenn Gregorio and Alvaro Pamplona provided expert advice to visitors who expressed interest in rice farming. Some of them said that listening to IRRI's experts had led them to consider rice farming after retirement. IRRI gave away sample packs of brown rice, pirurutong or purple rice, and climate change-ready rice varieties (Tubigan or RC 238 and Sahod Ulan or RC 284). Printed copies of Rice Today, information brochures, and Ang Mga Kwento ni Ryza (Nasa Tamang Nutrisyon ang Kalusugan ng Palay) in CD format were also available to visitors. The two-week training course on rice technology transfer systems in Asia was held on 30 July-10 August 2012 at the International Technology Cooperation Center of the Rural Development Administration (RDA) in Suwon, South Korea. The course was attended by 15 participants from Bangladesh, Cambodia, Indonesia, Lao-PDR, Nepal, the Philippines, South Korea, Sri Lanka, Thailand, and Vietnam and is on its twelfth offering. It has now trained more than 160 middle-level research and extension officials from 18 countries. The course was jointly sponsored by RDA and IRRI and aims to (1) show an example of a systematic technology transfer mechanism linking multiple stakeholders; (2) provide participants from Asian countries exposure to different models of technology transfer in rice and analyze components of successful research-extension linkages; (3) explore contemporary issues in the maintenance of effective technology transfer processes; (4) prepare participants to emulate selected models and experience rice technology transfer; and (5) create awareness of Korean development programs in each of the participant countries. Resource persons were Noel Magor, David Shires, and Achu Arboleda from the IRRI Training Center and Kim Jung Gon, Young-Chan-Cho, Hyundong Lee, and Je-Kyu Kim from RDA. 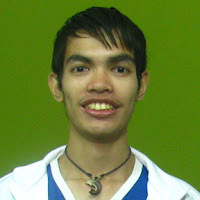 The 2012 basketball season of the IRRI Sportsfest has ended for men's and women's divisions on 23 July and 3 August 2012, respectively. In men's basketball, the Red Team emerged as champion in brackets A and B in the best-of-three series, while the Yellow Team won the championship for women's. Other games that have concluded in this year’s Sportsfest are men's softball, football (mixed), and lawn tennis. View team standings as of 3 August 2012. Remaining events are badminton, bowling, men's volleyball, and women's volleyball. 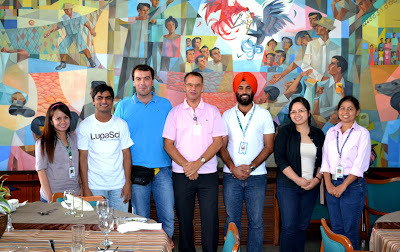 IRRI, International Potato Center, and WorldFish wraps up the month-long (25 June-25 July) integrated testing of One Corporate System (OCS) held at IRRI Headquarters. Key OCS users from IRRI’s human resources, project management, and finance units were given a special walk-through on the system's basic functionalities. The series of tests was carried out by system builders with the assistance of consultants from UNIT 4. During the tests, system builders based at IRRI, led by Eric Clutario, put in working time that overlapped with those based around Asia and Peru, where CIP headquarters is located. 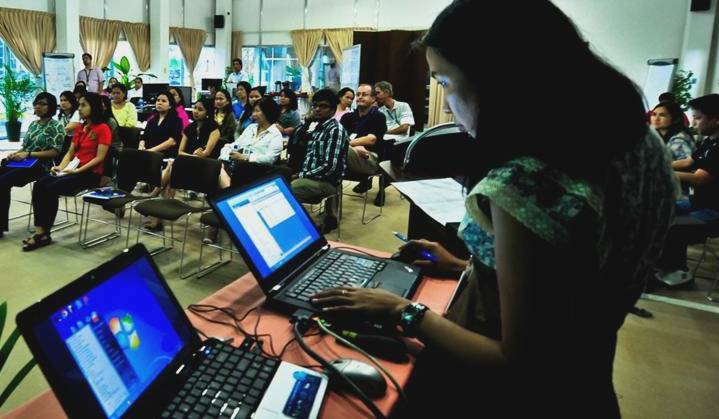 After the system test, IRRI system builders and key OCS users will be doing OCS localization, user acceptance testing, and end-user training over the next several weeks. OCS is a new system aimed at helping improve the efficiency of IRRI's processes and increase collaboration among CGIAR centers. It will be implemented at IRRI headquarters in a phased rollout starting October 2012. Updates and more information available on the OCS website.